The story of this medieval poet and singer born in India during the 15th century is, understandably, shrouded in mystery and some say that his life spanned over 100 years. He composed songs in a relatively crude Hindi dialect called Braj Bhasha and historians claim that he was responsible for ensuring that this version of the Indian language passed into literary folklore. It is believed that he was born around the year 1479 though his place of birth is open to debate. Some say it was in a village called Siri, near Delhi, while others say it was in Braj. This area in northern India is generally linked with Lord Krishna. Legend has it that he suffered blindness when born and, like most families then, he was born into extreme poverty. Perhaps because of his disability he suffered a degree of abuse and was certainly a neglected child. He departed from his home at just six years old to join a wandering band of musicians that were religious. Again, with a nod towards the legend, he is said to have had a dream about Krishna one night who told him that he must live his life praising the Lord and that he should go to Vrindavan. 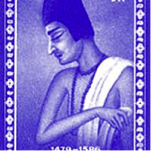 As a teenager, Surdas was taught Hindu philosophy by the saint Shri Vallabhacharya. His meditational methods of teaching put the young man on the clear road to spiritual fulfilment. He was initiated into a religious order by his guru and, because of his abilities as a poet and a singer, he sang regularly at the temple at Srinath. Surdas soon became well known as news of his musical and writing talents even reached the ears of Akbar, the Mughal emperor, who became his patron. He was now able to live out the rest of his time in relative comfort due to the donations and earnings from music, writing and occasionally giving lectures on subjects to do with religion. Surdas had a remarkable talent for memorising Sanskrit hymns such as Srimad Bhagavata along with many others. It was this that made him such an in-demand figure wherever he went, with his ability to pass on such important compositions. He also had a firm grasp of the life and achievements of Krishna and was able to portray all of this in his exquisitely crafted poetry. Many historians say that no one has ever done it better. The fact that the writer was blind makes it all even more remarkable. He went into incredible details about Krishna’s early life, such as where and when he took his first steps and what were his first utterances. He even described the infant cutting a first tooth! These tiny details were woven into poems and songs and some of them are sung even today by parents who see in their children some elements of Krishna . The legend of Surdas has caused him to be known as Sant Surdas, or “Saint”, such has been his impact on Hindu literature and philosophy. He dedicated his life to his faith, never once considering marriage or allowing anything to deviate him from his chosen path. His three major pieces of work were the Sahitya-Lahiri, Sur-Sagar and the Sur-Saravali. Although it cannot be proved because most of it has been lost, the Sur-Saravali ran to 100,000 verses. This incredible piece of work is a true reflection of the writer’s devotion. As stated above records of the man’s birth and death are unconfirmed but some say that he died sometime during the year 1586, thus making him 107 years old.